Besides as an instrument for time, a watch has become a fashion statement. This new Jaeger LeCoultre Master Compressor Diving Lady watch shows personality and personal lifestyle. A diving watch with a sprinkle of feminine touch without the “why are you wearing a men’s watch” factor, this is a perfect accessory for day or night. I probably won’t go diving with that watch because it would cost a couple of hundred dollars to replace the leather wrist band. 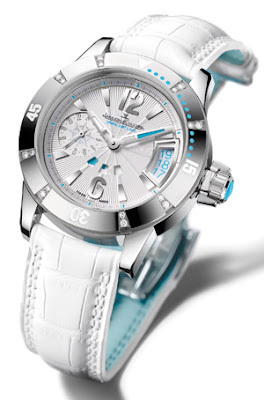 Why do JLC make a diving watch but a gal can’t go diving? Regardless, it’s still savvy worthy in my book. FYI, this watch retails from about $8000 to about $9300 for stainless steel. I love the white and aqua color combination. I guess I need to save more coins in the piggy bank. Update: This watch is being discontinued as we speak. There is a newer model coming out soon. wow i am not a watch person.. but i really like that one! but ouch $8000 to $9300!! watches are very in right now. I love the aqua and white color combo as well! O wow. Sporty and classy. Love it! it's so gorgeous, but look at the price! I haven't had a watch since I was like 14 when I had that crappy timex. I use to wear it on my belt loop to be cool like everyone and it fell off one day and I lost it. Very sleek! It's a really cool design. i like it but the price point is killing me too! I tried the watch on before but it's too big for my wrist. I adore watches. Back in the day, I had many styles of Swatch watches. I miss those! Oh my. Wicked classy and cool, I love it! have always loved watches but im more of a cartier girl myself. you have great taste though. JLCs are the creme.